Whew, it’s been a very busy week. First, I helped my daughter move from the northwest end of the Denver area to the southern end which is much closer to her work. This will make her life so much easier especially once winter arrives and the snow starts to fall. 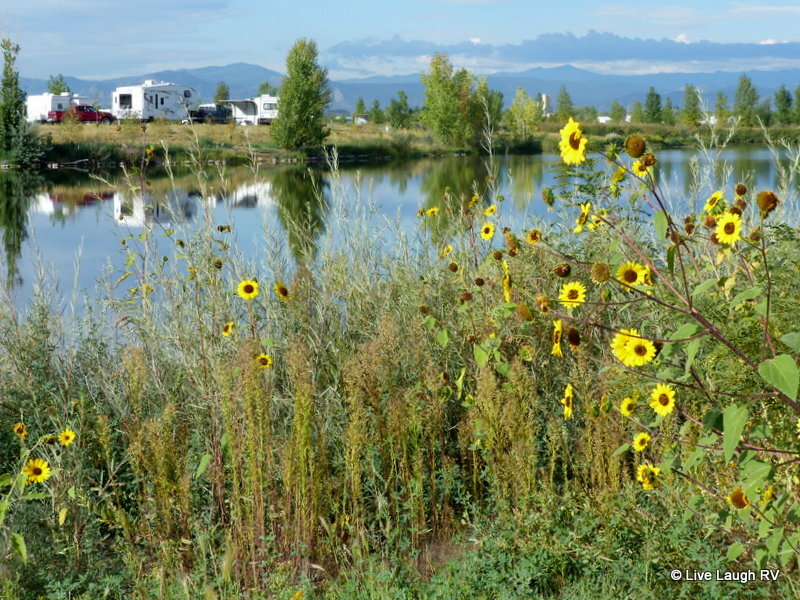 Second, hubby and I moved from the Westminster Elks Lodge, which was home base for us for the better part of the summer to the Chatfield State Park. 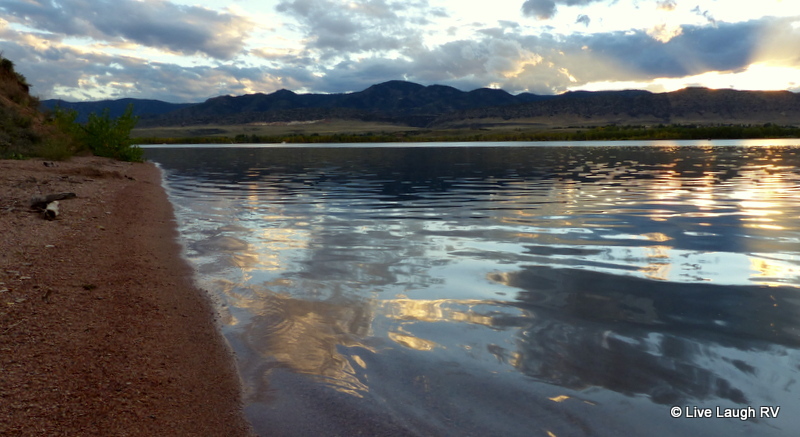 Ah, camping near water once again….. we love it. As I sit in my comfy chair admiring the view, Al and I discuss our stay in the area. 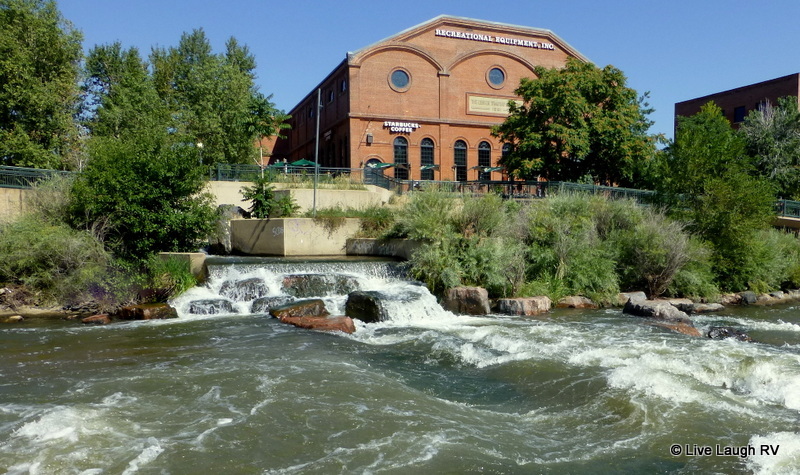 Although we initially planned to be moving around the state of Colorado all summer, we realized sitting in one location for awhile gave us plenty of opportunity to explore the Denver area leisurely. One of the things I’ve loved discovering this summer in Denver, Colorado, are the unique businesses located in repurposed structures. The first of such places we visited was the Recreational Equipment Inc. Store. 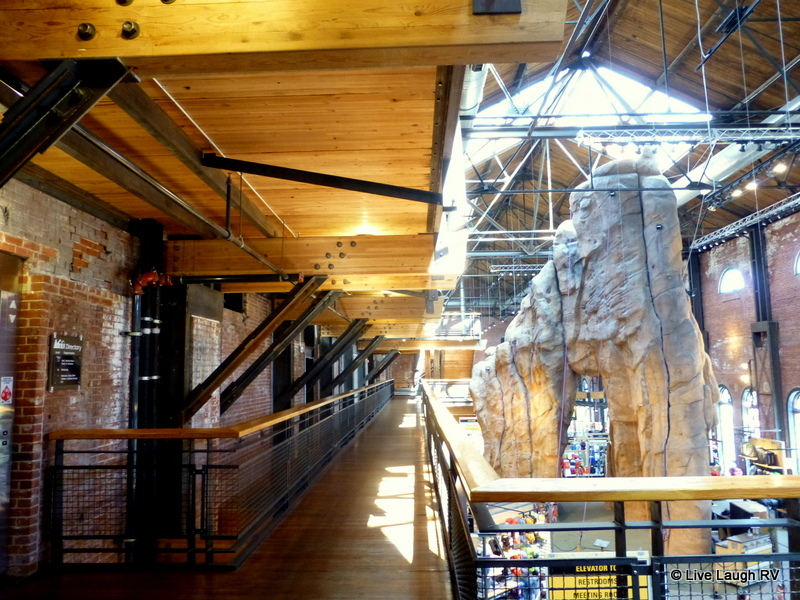 The REI Store is housed in a building built in the early 1900’s and was used for electric streetcar lines. Since I already did a post about this building, you can click here to read more about it. 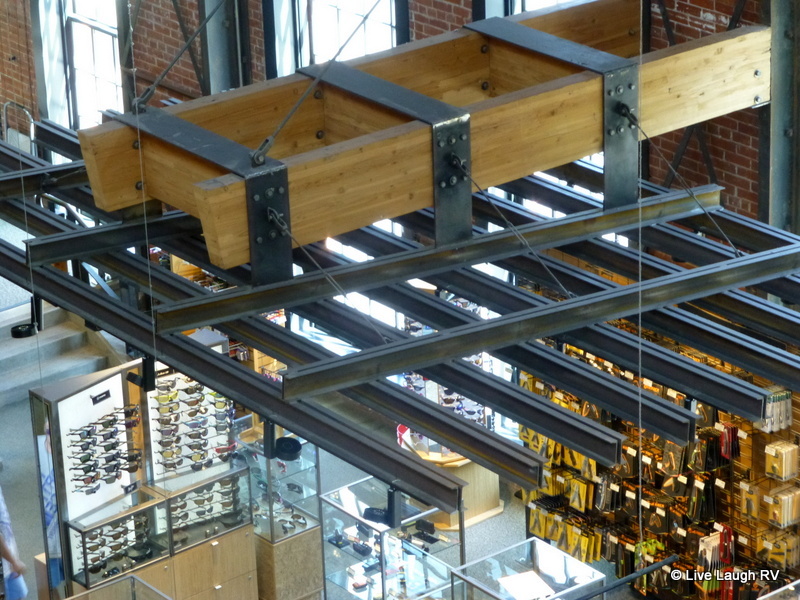 With each subsequent visit to this REI Store, I noticed more and more of the little details like the old rail tracks being repurposed. If you look closely in the photo below, the rails are used for the track lighting. Much of the building and its history has been beautifully preserved. Another unique find was a former 1880’s brick structure that was formerly a foundry and has been turned into a home for a couple of restaurants and an unusual collection of shops. 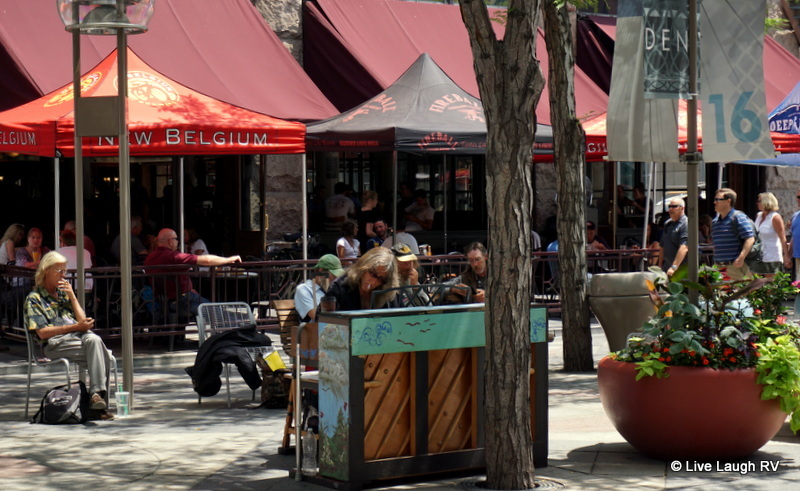 ‘The Source’ is located in Denver’s River North District. 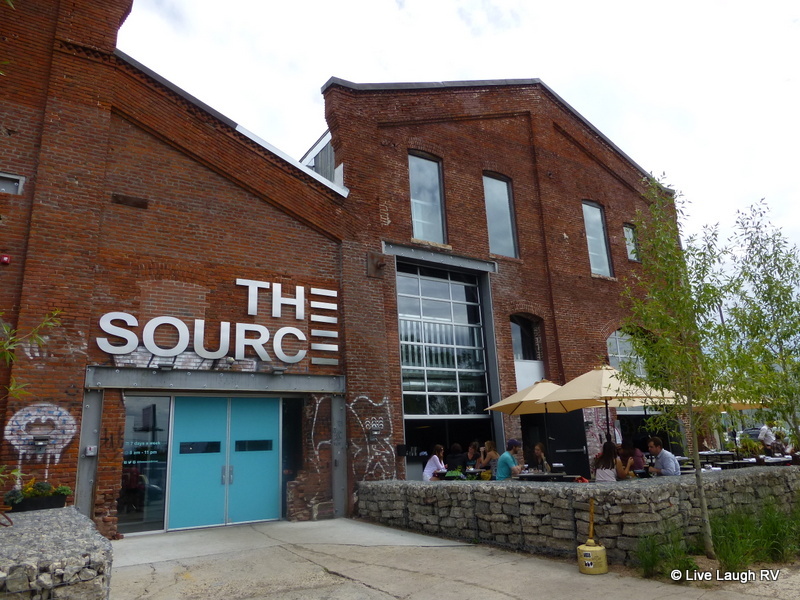 The Source is considered an artisan food market with such specialty shops as; Artisan Bread Bakery, a Butcher Shop, Floral Shop, Liquor Shop, Coffee Roaster, Cheese & Spice Shop and the Crooked Stave Brewery to round out the selection of businesses. 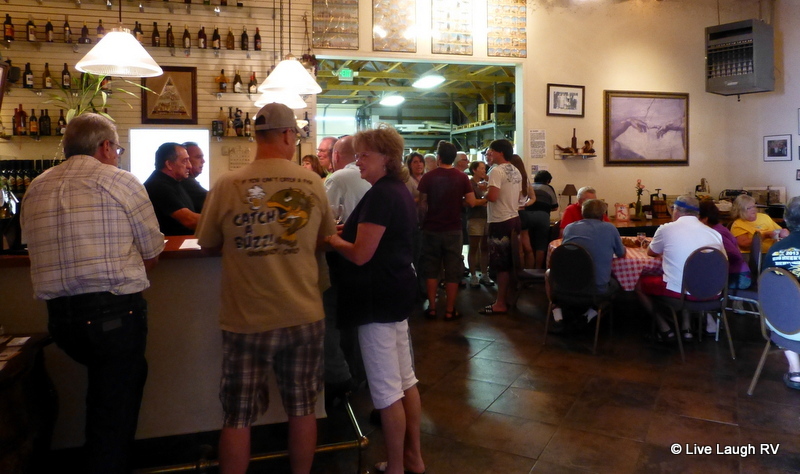 Turning a garage into a wine tasting room – That’s exactly what the Spero Family did. 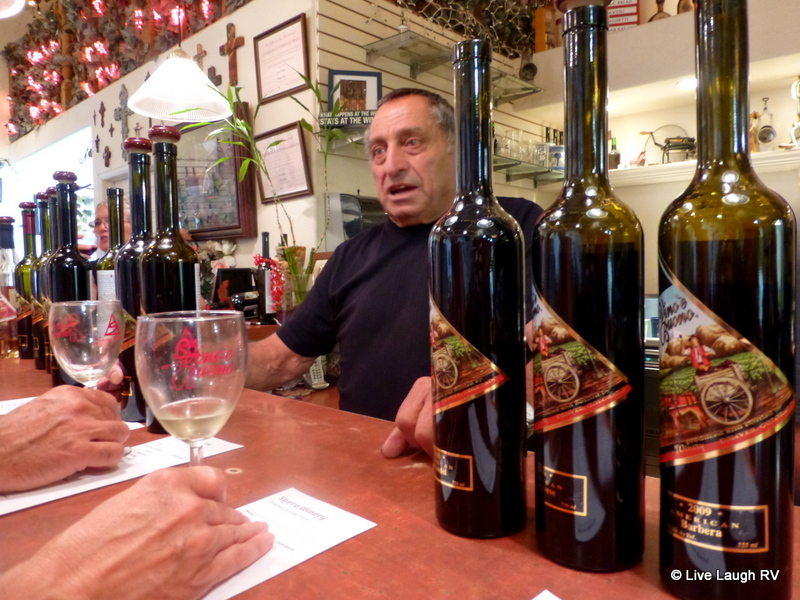 Spero Winery is a family owned and operated winery. We found ourselves visiting this establishment a few times during our stay at the Westminster Elks Lodge. The fact that there is FREE wine tasting every Saturday and is located less than 5 miles away from home sure made it irresistible. And yes, it is totally free and the pours are generous. They even offer a cheese, salami, and cracker platter free. During our visits, we noticed a vast array of clientele from young to old and everything in between and the wine was good. 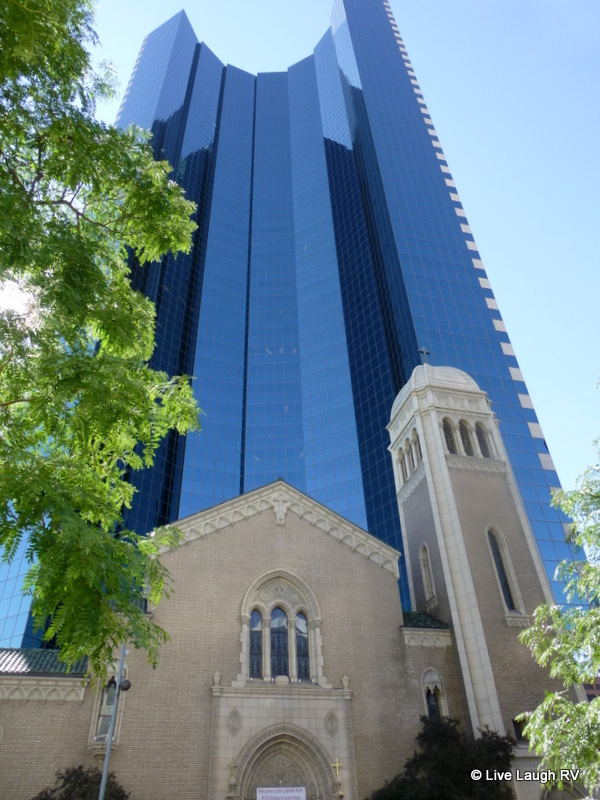 The biggest surprise to me was the abundance of beautiful buildings in Denver. It was a joy just walking around the city of Denver taking in the unique structures. I was so enamored with the Cathedral Basilica that I even attended mass one Sunday morning. The stained glass, Italian marble, and overall structure is simply stunning. I had heard from locals that I needed to see the Holy Ghost Catholic Church. At first, I wasn’t sure why until Al had me walk across the street from the church. It looks as though the architects of this modern skyscraper designed that structure to appear as a large protector of sorts. The combination of new and old buildings seemed to work in harmony throughout the entire city of Denver. How about repurposing old pianos? That’s exactly what you’ll see walking the outdoor Sixteenth Street Mall. These pianos are available for anyone to enjoy. A city, is a city, is a city and as thus Denver is like any other city and has it’s fair share of homeless people living on the streets. 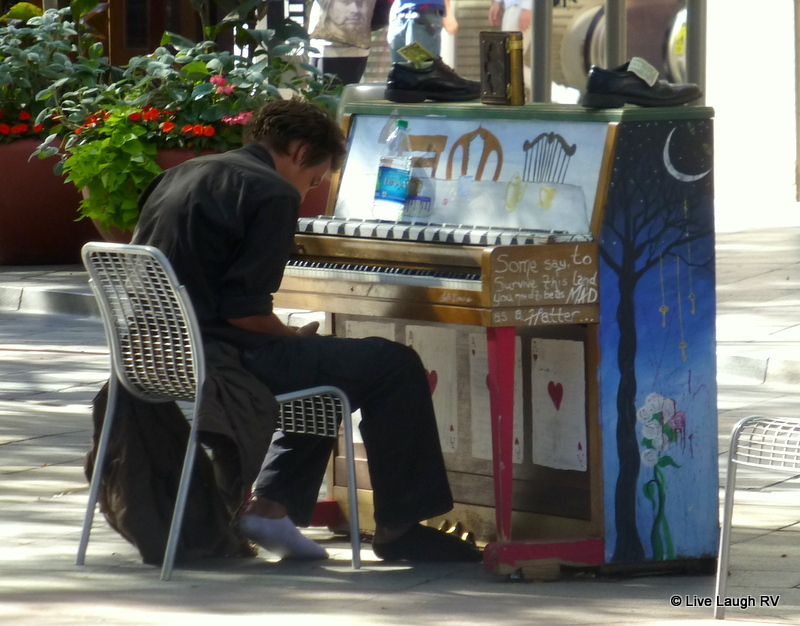 That said, it’s not uncommon to see a homeless person (or at least one that appears homeless) playing one of these pianos. Sometimes the tune is basic and other times the raw talent stops you in your tracks. One time, my daughter and I just stood there, mouths opened, listening as a guy was banging out Beethoven’s fifth. Needless to say, an appreciative crowd gathered. It almost brought my daughter to tears as she asked, “Mom, how can someone with so much talent end up living on the streets?” I’m sure we weren’t the only on lookers asking this question. Probably the most impressive repurposing I discovered is located 30 minutes north of Denver. What was once an ugly gravel pit is now a beautiful state park complete with ponds that are perfect for bird and fish habitat. We found the St. Vrain State Park to be a lovely facility which we thoroughly enjoyed calling home for 5 days. I was also impressed with Denver’s artistic sculptures displayed throughout the city. I’ll save that for another post as this one is getting a little winded. In closing, I’ll share one final photo ….. a photo of MY favorite kind of ‘church’ FYI…. we’re hitting the road Sunday. Lake Mead here we come! We definitely need to return to the area and spend more time in the city and the parks. Enjoyed reading about all those interesting places, and thanks for taking the time to write about them all. Safe travels! We’ve really enjoyed our summer in the area. Our favorite spot yet was Chatfield State Park. We would love to stay a month…. it was perfect. We’re on the move right now so the blog post about it will be delayed a tad. You make me want to pack a bag and head to Denver for a visit. Loving your captures – thanks so much for sharing the wealth of information on Denver 🙂 Happy Week! Thanks Renee. It was fun having the summer to explore this beautiful city. We waved to you as we drove by Chatfield on E470 yesterday morning on our way back to Texas. There were 3 balloons in the air and a 4th about to rise. 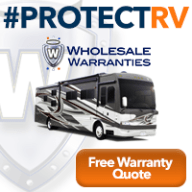 Have a safe trip to Lake Mead! Thank you Karen…. would love to meet. We just arrived at Lake Mead and it’ll be in the 90’s today. Hmm, I think we arrived a month early LOL. 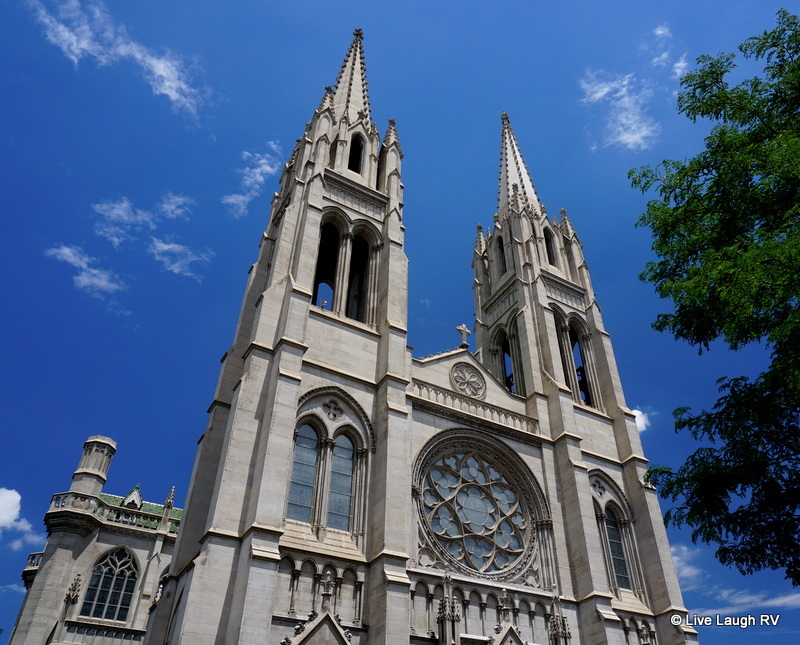 “I was so enamoured by Cathedral Basilica I even attended mass..” This made me laugh out loud, Ingrid! Something I would totally say. I wondered if I was projecting until I saw the pic of “your kind of church”. It’s clear we are soul sisters in that regard. Headed to Lake Mead? I’m not exactly sure when we’re headed back down to Vegas yet (house listing and all) but would love to meet you if we’re in the same general area at the same time. Well safe travels! Can’t wait to hear where you hit next. Ingrid, I have visited the REI in Denver many times and never walked around the OUTSIDE of the building! Great summary post. Never been to Lake Mead. Looking forward to your stay there! We lived in Las Vegas in the nineties and I would take the kids to Lake Mead regularly but haven’t been back in years. Should be fun. I can’t wait to visit there. My buddy closed on her house there today! Tried to fly home, but freak started fire at control tower of ORD. Flight delay till sunday. Bummer. Boy am I looking forwarding to visiting Denver again. We’ve only ever spent a day or used the airport. Ingrid, you have done a fabulous job showing the unique features of the city. What great repurposing of beautiful old buildings! I appreciate all the time you spent providing this tourist guide for us:) Of course, that REI is top on my list! How cool is that structure behind the Holy Ghost Church! Safe travels to Lake Meade. We might get there eventually. One Sunday morning we strapped on our hiking shoes and hiked around the city. The pro cycling challenge event was taking place in Boulder and Golden closing roads thus we wanted to avoid those areas and opted for an urban hike. Hiking throughout downtown Denver was great and we found it more enjoyable than we imagined. Well Ingrid, Im convinced. Since never been in Denver except at the airport, perhaps once we are fully on the West, a month or so is in order in CO. With your ideas and preview we have plenty of things to do when we get there. 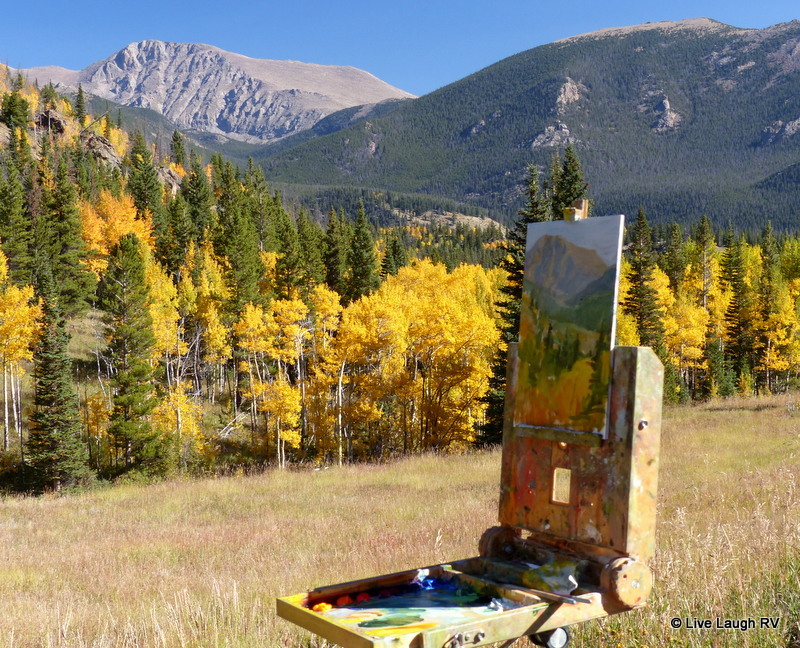 Fall is so beautiful with those Aspens against the Pines in Colorado! I agree with you totally about YOUR kind of church…mine too! We are stuck here until Thanksgiving, Dennis is about to begin combining corn and beans..frustrated farmer!..Florida awaits…again..Hopefully this time we can be there longer than 5 weeks!!! Ah, there’s something about fall in the Midwest that calls to me…. Carmel apples, apple cider, red barns, plowed fields, colored leaves, and a chill in the air. Perhaps I’ll always be a Midwestern gal at heart…. but not enough to have me move back LOL. Safe travels to you. Let’s hope for a warm winter in the south! What a wonderful, rich summer you’ve had, Ingrid! You’ve enticed us to visit Denver — I haven’t been in more than 20 years. Thanks for the great photo tour — we seem to enjoy similar things (gourmet food shops, outdoor stores, wine tasting, and nature!). 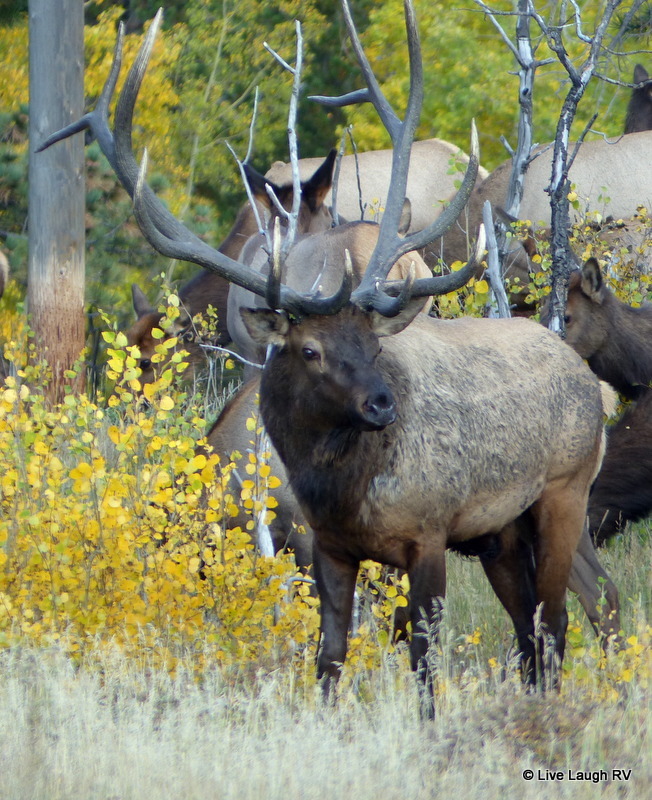 Do you think September is a good time to be in Colorado? We could make our way there after Lopez Island next summer. Thank you so much, Ingrid — you are a wealth of information and so generous in your sharing. 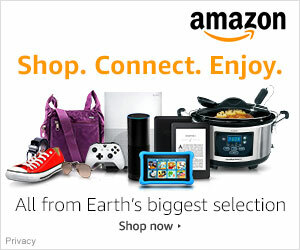 We’ll definitely be in touch! Wish we were going to be meeting up with you in Texas this winter, but my dental work is keeping us on the west coast. ;-( How far in advance did you make your reservations at Chatfield? I so enjoyed this post! I had forgotten about those random pianos. You’ve done such a wonderful job presenting the many interesting and beautiful aspects of Denver and the surrounding area. Love your photography! 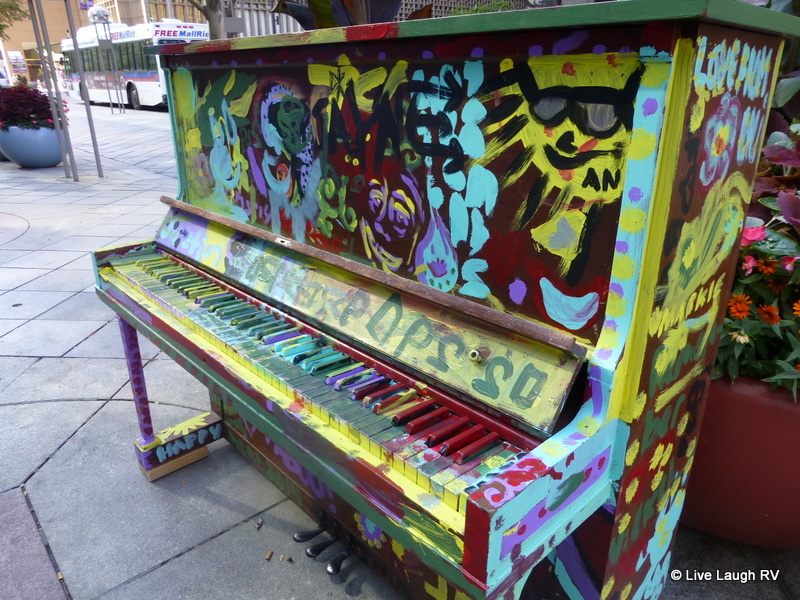 Loved seeing the re-purposed pianos. I think i would have to have a bash at those keys, although the regulars would probably outclass me. 🙂 What a marvelous transformation of the gravel pit into a place of great beauty! Your last photo is really awesome, and I so agree with you, Ingrid. Have a great trip. ThIs brings back memories of our first year on the road and our stop in Denver. Back then we knew nothing about all these gorgeous state parks. I can see this being a great place to spend summer. Isn’t it amazing how much we learn and grow that first year? We now have no second thoughts about squeezing into tight campsites or driving roads we wouldn’t have considered 2 years ago. Fun adventures! I think it’s great that new uses are being found for older buildings. Enjoy your stay at Chatfield – I could have easily spent a month there during our visit last October. I think quite often talented people like the piano player choose to live the type of life they do…. fortunately we don’t all want the same things as there is not enough to go around…. Not a bad place to spend a summer. 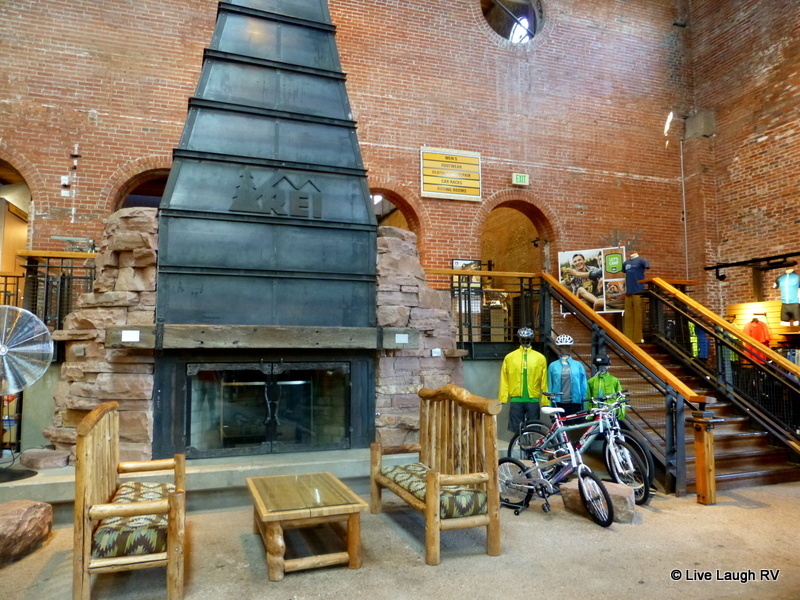 Since we have been at Cherry Creek SP we have had a couple of bike trips into Denver, including the REI store. Wish we would have known about the free wine tastings. Love that last image Ingrid. You have captured the fall colors at their peak.